Put your celery in aluminum foil for storage in the refrigerator, it stays crisp much longer than without the foil. Thank you Miss Maryellen Gibbons and my neighbor Anita for the great tips. 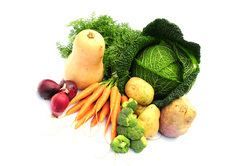 This page is to provide information on the do's and don'ts of storing vegetables and herbs. Some you may know and some may be new to you but all are helpful.